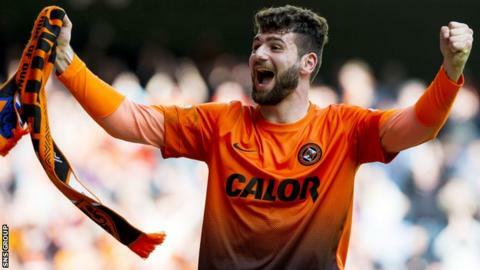 For Nadir Ciftci, it was a moment he would scarcely have imagined in his wildest dreams. For Rangers it was the revisiting of an all-too-familiar nightmare. The game stood at 2-1 going into the closing minutes. Rangers looked spent, but where there is time there is hope. They had the ball and then gave it away. Possession coughed up cheaply and then compounded by a defensive calamity, a blunder so comic and so ruinous as to eliminate any prospect of a comeback. A knockout blow to go with the sucker punches from earlier in the day. A sequel to last Sunday. Different competition, new opponents, but same old vulnerabilities and the same endgame. Rangers exited the Scottish Cup, not solely because of Dundee United's ruthlessness but because of their own hapless deficiencies. United progressed and they deserved to despite an indifferent performance. Decent teams can do that. They had been out-run in midfield and had lived on the edge more often than was healthy. When they set off on the road from Tayside they left much of their best stuff behind. Their elan for a start. It was absent. The effervescence of their youth. Largely flat. By the standards they have set themselves this season, they were well below their best, but given some of the football they have played this season a place in the final is a just reward. They did not have much of it here but they have class in their ranks. They have the capacity to make the final special. Rangers pestered them at Ibrox. They can take succour from that, no question. There was a response to the Ramsdens Cup final failing at Easter Road, no doubt about it. They were focused and intense. They set the tempo, refusing to allow United to settle while causing panic in their defence. It was pinball in that United penalty box at times. Defenders in a flap in front of a goalkeeper who was skittish. But what good is lots of possession of the ball if you cannot make it count? What is the point of creating terrific chances if you are only to go and miss them? Seismic moments? In the breathless madness of that opening half, they came in waves. The collective wisdom going into this semi-final was that Rangers needed to go in front, needed to rattle United's younger team with a goal and shake with them with the noise of their crowd. Needed to spook them, in effect, with a 'Welcome To Ibrox' moment. United had no right to be one goal ahead, not to mind two. But they were. They were not lucky and Rangers were not unlucky. They took their chances and Rangers did not. Luck did not come into it. Dean Shiels had the golden chance and he blew it. In the 19th minute, he went through one-on-one with Radoslaw Cierzniak but pulled his shot wide of the goalkeeper's left-hand post. When he thinks about where it all went wrong, Ally McCoist will ponder the damage done by Shiels in those seconds. What a glorious opportunity to plant seeds of doubt in United heads. What a thunderous waste. It was a tale of number 10s. Rangers' missed and, four minutes later, United's scored, Stuart Armstrong's clinical finish proving an embodiment of one of the gulfs Rangers are going to have to breach on their way back to the Premiership. It was all so reminiscent of last Sunday against Raith Rovers. Bilel Mohsni misses and John Baird scores. Only this time, the contrast between finishing and not finishing happened twice on the same day. Cue seismic moment number two: Jon Daly's glaring miscue down one end and United's rapid-fire response at the other. An explosion of class from Ryan Gauld took him past Richard Foster. Then a finish, albeit with a slice of luck, from Gary Mackay-Steven. They had no right to be one goal ahead, not to mind two. But they were. They were not lucky and Rangers were not unlucky. They took their chances and Rangers did not. Luck did not come into it. For the guts of two years, Rangers have lived in a world where profligacy goes largely unpunished, where mishaps at the back and missed chances up front rarely lead to failure. In the lower leagues they get away with it. Down there with the part-timers they will always get another chance to score, always another chance to make amends for a sitter missed or a soft goal given away. United were in generous mood, but not overly generous. They allowed Steven Smith to score from a free-kick that should have been dealt with by Cierzniak. They gave Rangers hope as the interval approached, but then found themselves as a defensive unit in the second half and gave them little thereafter. Cierzniak made one save after the break and that was about it. McCoist feasted on crumbs of comfort. His team created chances. They were better than last week. They brought much to the semi-final. They should be proud. Jackie McNamara did not need to wring the nuances out of the result. The bottom line was good enough for him. Maybe he was a little unkind in downplaying what Rangers brought to the game. Maybe he understated the trouble that McCoist's team caused them at times. All that mattered to him was that they won with goals to spare and that at the end of a fine season they have guaranteed themselves a big day out. They celebrated their victory with the fans as the Rangers men beat another retreat. Not quite the same as last weekend's catastrophe, but a painful reminder all the same of their place in the grand scheme of Scottish football.